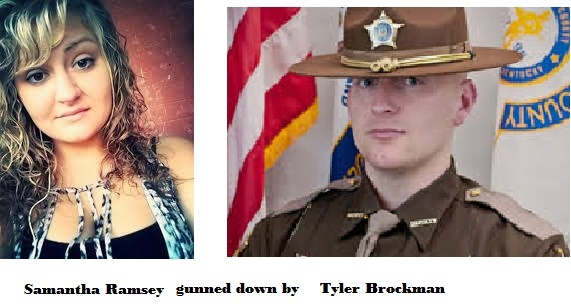 Samantha Ramsey, a 19-year old girl was gunned down by Boone County, Ky. deputy Tyler Brockman on Saturday, April 26 2014 after she left a party; Samantha was accompanied by two of her friends when the killing happened. There was a time when we made excuses for incidents of police officers mistakenly shooting an individual. This trend of police officers gunning down private citizens is unacceptable. I would surmise that society would be best served if only an elite group of physically, emotionally and psychologically well trained police officers are allowed to carry firearms on the job. The primary duty of a law enforcement officer is to protect the citizens of the community; everyone should feel comfortable seeing, interacting with law enforcement officers. Just the opposite is true today. Almost everywhere, there is a palpable distrust and disdain for law enforcement officers, and it’s justified most of the time. The trigger happy law enforcement officers, such as deputy Tyler Brockman, should be taken off the streets, retrained, re-assigned or relieved off their duty for anything less is unacceptable in a civilized society. How would you solve the problem of trigger happy police officers?